Today March 1st is World Book Day, a day that strikes fear into the hearts of parents as they cobble together a Gruffalo costume at the last minute! Books are so important to us as a family, we both have memories of being read to as a child, and reading is still an important part of our every day life. I have admit I have neglected books a bit for myself sence having Joseph, however I do read to him everyday. I have chosen a small selection of Joseph's books to share with you. This book was first published in 1983 and I remember reading it as a teenager. I knew that this would be an important book should I ever be lucky enough to have children of my own. My sister sent it to me when Joseph was still in NICU and I read it to him in hospital. What I love the best about this book is it mentions Tasmania, which is integral to the story. The illustrations are beautiful and complement the sweet story perfectly. Six Dinner Sid - A Highland Adventure by Inga Moore. There are two Sid books equally loved, but I think I marginally prefer this one. Six Dinner Sid has been an important part of our lives recently, as we explain to Joseph why Niow Niow doesn't live with us anymore (see Tuesday's blog post). Sid, like Niow Niow, is ruled by his stomach, which often leads to misadventures! This story is beautifully told both with words and illustrations. I could have picked one of a dozen of Julia Donaldson books, they are all brilliant, but I especially love this one. The illustrations are so beautiful and I love the colours and sparkle. The story is beautiful too, and tells the story of difference just wonderfully, and is a great way of explaining cultural differences to toddlers. Some of the language is delightfully Northern, which is quite sweet too. I think for reading out loud Julia's books are just wonderful, though you do feel you should be talking in rhyming couplets at all times once you've read a few! My niece Livi said we had to buy this for Joseph, and I'm very glad we did as it has become a firm favourite. It tells the story of a cheeky tiger who comes to visit Sophie and her mummy and eats and drinks everything n the house. It is so simple and the line drawing illustrations are lovely. This book is an enduring classic, and one I remember from my own childhood. Joseph loves this book which he received for Christmas. It's about a little boy called Stanley who lives not far from where we live, and his stick. Joseph shares Stanley's stick obsession, so it is very apt. The book has a poetic feel with lovely simple illustrations. I'd love you to share your favourite children's books! 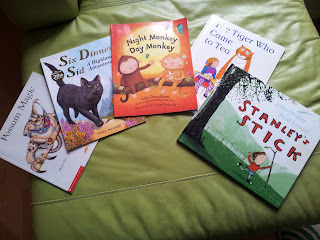 Big Julia Donaldson fans in our house too. Our current favourite is "What the Ladybird Heard." All of Hairy Maclary. Julia Donaldson. Giles Andreae 'Pants' and 'More Pants'. Anything with illustrations by Nick Sharratt.